I’m enough of a book nerd that I enjoy re-reading beloved books and finding something new to appreciate and admire each time. I’m also excited when I learn that a favorite writer is coming out with a new book. Yet nothing matches the thrill of discovering talented new novelists. That’s what I’ve been doing the past few weeks, and I’m delighted to share with you this trio of compelling new voices. Rarely do I lose sleep worrying about the fate of fictional characters. 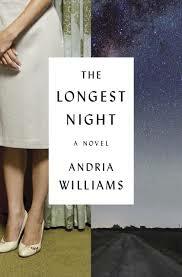 But Andria Williams’ debut novel, The Longest Night, kept me up late and troubled my dreams. It’s 1959, the height of the cold war. Nat, a spirited young woman from California who has never seen snow, finds herself facing winter in the small Idaho town where her Army husband has been stationed. She and Paul married impulsively after a brief courtship, and now have two young children. Nat is proud of Paul’s job working on the Army’s nuclear reactor and eager to be his helpmate. His reserve had always made her cherish their intimacy, feeling “whatever strange majesty was in him was known to her alone.” But as his quietness grows into secrecy, so does her feeling of being trapped and isolated in a town where she knows no one yet is judged by everyone. Paul realizes his marriage is in trouble, but he has more urgent worries: something is dreadfully wrong with the nuclear reactor – and his superiors are doing everything they can to cover it up. Based on the true history of a fatal nuclear accident, The Longest Night creates a tingling sense of foreboding on page one that only continues to build. With crisp descriptions and sharp, compelling dialogue, Williams brings to life a set of vivid characters, and the mood of a mid-century America on the cusp of the nuclear age. A troubled son who joins the Marines and returns from Iraq physically whole but psychologically ravaged. A loving mother who works for a military defense contractor and climbs to the top of the executive ladder at the cost of too much compromise. A moment in which everything goes terribly, irretrievably wrong. I suppose Elizabeth Marro could have come up with a premise more certain to reel me in, but she would have had to name a character after me. Ruth Nolan has worked hard to achieve a way of life no one in her family could even imagine – the house on the beach, the fancy car. Security. She single-handedly raised her son Robbie, a loving boy who grew into a surly youth and never quite got a grip on adult life. It’s impossible for Ruth to believe that. On the last day of Robbie’s life she had noticed his eyes “shining with need,” but had still canceled their lunch together to deal with a serious work emergency. Shattered, she packs Robbie’s ashes into the fancy car and runs away from her life. It’s here that the novel takes a surprising and ultimately rewarding turn, sending the reader on a gripping journey of grief, guilt and intimacy as Ruth careens across the country, chasing the faint glow of redemption. 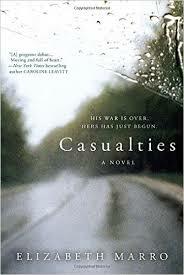 Casualties explores the personal and permanent costs of war, including the moral injuries suffered by those who wage war, those who love them, and – all too rarely – those who profit from it. Poor Marty Wu. She finds herself in such distressing situations, and all I can do is laugh. Marty lives in New York and has a job she hates, selling ads for a magazine she’ll never read, working for a boss who used to be her boyfriend and sometimes behaves like he still is. Despite all the self-help books Marty reads, bad things happen to her, and many are her own fault. She’s clumsy, earnest, immature and hilarious. We get to know a lot about Marty’s inner life, because the novel is written as a series of journal entries she jots down on her way to a new, improved self. Marty has a dream to own a small costume shop that lets people shed their skins and become someone else for just a night. And she has a living nightmare in her formidable mother, who’s not only impossible to please but downright abusive. Marty’s daily life is a tightrope act so familiar to the children of immigrants, pulled between the culture of her family and the American reality she lives. When she loses her job and alienates her best friend in an escalating series of all-too-preventable stumbles, she flees to Taiwan with her mother. There Marty soaks in the support of her extended family and uncovers family secrets that force her to take a fresh look at her mother and herself. With its light touch, Not a Self-Help Book treats serious issues with humor and humanity. It introduces us to a heroine for a new era, a wacky, wistful, hyped-up version of our own inner anxieties. 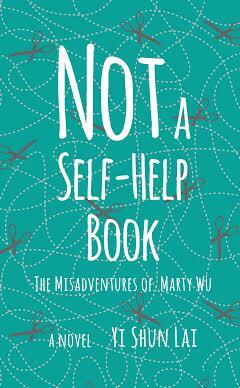 Not a Self-Help Book: The Misadventures of Marty Wu will be published in May 2016. If you want to buy this book – and you should – pre-order it directly from the publisher, and you’ll get a 30% discount. The novel is published by Shade Mountain Press, my own publisher. This makes Yi Shun Lai a sister of mine, although we’ve never met. Now that you know about this caveat, you should also know this: I am not a big fan of comic novels, but I recommend this one whole-heartedly.